A diversion from the river in Rotherhithe might be about to become redundant. At present upstream walkers, having crossed Greenland Dock, must suddenly turn inland down narrow Randall Rents because, although New Caledonian Wharf ahead has a good path, there is no walkway further on. At the end of Randall Rents, the diversion continues past the back of The Ship & Whale pub and along Odessa Street to return to the water by way of the far side of Commercial Pier Wharf. Southwark Council has approved a planning application for flats on the Commercial Pier Wharf. The scheme includes provision for not only a riverside path in front but also a downstream extension path across the narrow Custom House Reach to link with New Caledonian Wharf. This would provide a continuous route by the river from Greenland Dock to Surry Docks Farm. However, the Commercial Pier Wharf site is well-known for its red crane which would have to be removed so planning permission will only be granted if Historic England (English Heritage) decide not to list the crane. There has been a crane on the site for at least a century. 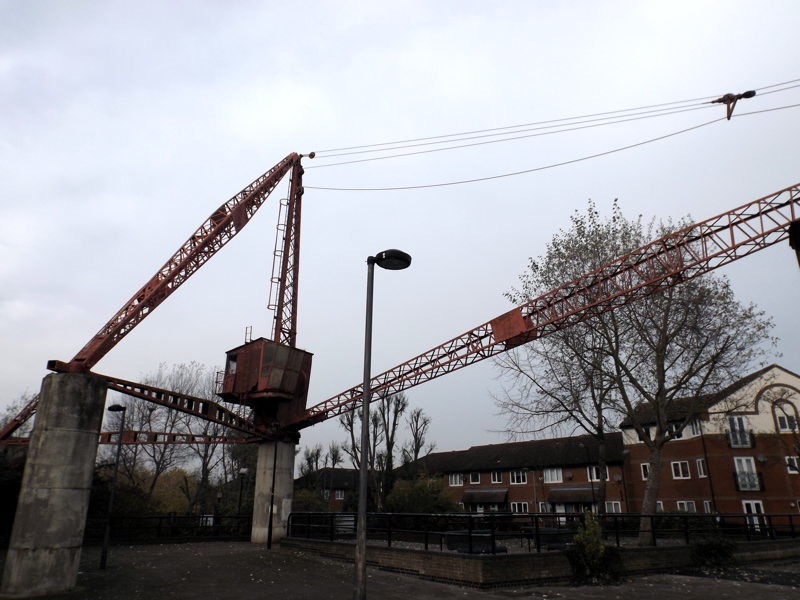 However, Southwark planners claim that the present red Scotch Derrick crane is not old at it was installed only in 1965. Retaining the crane will require a new design for the development and a new planning hearing. The development’s architect is Simon Hudspith who once promoted a scheme for a Thames riverside path in front of Winchester Wharf and through London Bridge. Let heritage and the will of the people be the victor here, not the greed of developers. A path can be made and still keep our historic crane/derrick.. The crane is a fantastic part of our heritage, can’t see why the path couldn’t pass underneath. Great space for a community wildlife garden underneath it. Grow ivy up the pillars, raised beds full of lavender or pollinator friendly low maintenance planting. Green it up and make it a visually appealing community space that compliments the farm and improves the thames pathway. Small donation from local developer would cover the cost easily Im sure.